Out of stock since Monday, 7 January 2019. Due back soon. Store at 10 - 20 degrees C Maximum. Does not contain any artificial preservatives. 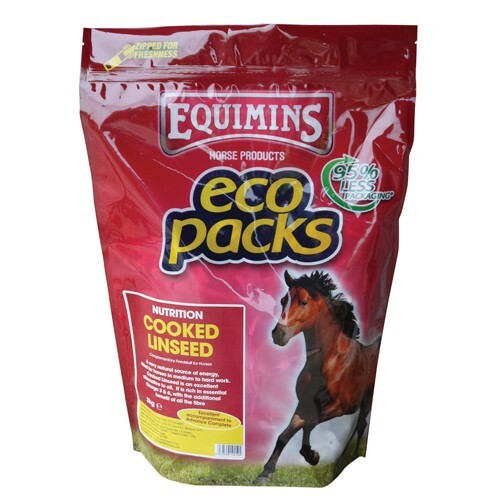 Below are some recent questions we've received regarding Equimins Cooked Linseed for Horses, including answers from our team. Hi, I have two large horses both weighing approx. 600kg How much cooked linseed would I need to feed, how long will a bag last? The recommended rate for large horses is 140g per day. How long a bag lasts will depend on the size of bag you order. As an example a 20kg bag would last around 70 days when feeding two horses at 140g each a day. Will it make my horse lively? Hello - I would like to feed my Welsh Cob linseed meal due to its high content of Omega oils, helping her joints & also general condition but I am worried that with oil being calorific/extra energy, could it make my already lively mare even livelier? Given the extra calories it is likely that your mare will have more energy on this supplement but oil is considered a good source of non-heating energy so you shouldn't notice that she is more lively than usual. I would try her on it and see how she gets on. You can always stop if she becomes too exuberant! I want to order a large quantity for my 2 horses. However I live in Portugal and already temps are very high. I cannot keep this product cool. Once opened how quickly will the product go off in the heat please. It is difficult to know how quickly this will go off as it depends on how much fresh air gets mixed with the product each time you use some, as well as the actual temperature it is stored at. Ideally it should never be stored above 20 degrees C. I would have to say that you should look at getting some sort of refrigerator to store this in. Old fridges are very cheap in the UK and it does not matter how battered they look, as long as the cooler works and the door closes. I would guess you could get an old fridge in Portugal so that would be your best bet.